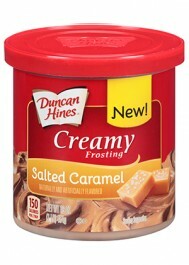 A big trend in baking: salted caramel! With this frosting you can go all directions. The frosting is amazing in chocolate cakes, as a crème between sandwich cookies, in apple pies and caramel brownies. Sugar, Vegetable Oil Shortening (Partially Hydrogenated Soybean and Cottonseed Oils, Mono and Diglycerides, Polysorbate), Water, Corn Syrup. Contains 2% or Less of: Corn Starch, Salt, Artificial Colors, Natural and Artificial Flavor. Preservative (Potassium Sorbate), Sodium Acid Pyrophosphate. Citric Acid. Sodium Citrate, Yellow 5, Red 40.